Love the image, love the card, as I'm sure did Harry. your card is gorgeous. I love the colours. I've just discovered I'm in your blog list; it's a great honour. Thank you! Your card for Harry's 90th birthday is fab, Sylvie.I love the image and you coloured it perfectly. 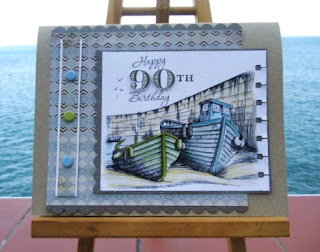 Lovely cards you've made over the last few posts Sylvie ..you have also reminded me I have this lovely boat image but still not used it. Brilliant card as usual Sylvie. Love the image - so appropriate! Yum, Sylvie! This is like a framed art piece inside a framed art piece! Fantastic!! When I get home from babysitting the grandkids, I will check to see if your posts are showing up on my dashboard. This is gorgeous Sylvie. Love the image and it's beautifully coloured. Hope Harry had a lovely birthday. Thank you for joining us at ALBC. Good luck.